This year I wore the same mask that we had bought last year at Party City and like last year I borrowed VTS’ special coat that he had custom-made in India (Akastski’s robe). 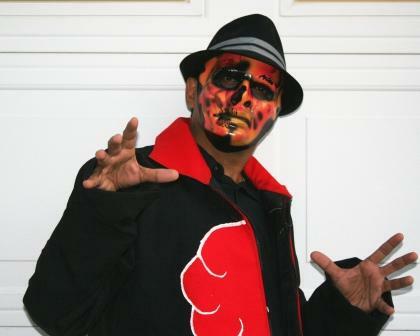 On top the $5 mask and the custom robe, I put on a black hat and the combination gave really ghoulish set-up for the Halloween. 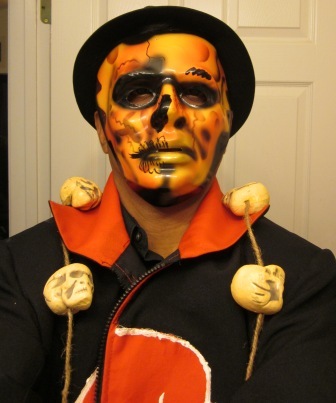 I made sure that young subjects were not frightened by the costume by confirming who were at the door before handing out candies. It was a fun evening. Our kitchen faucet has been not functioning properly for about a month. It was not that old faucet (may be four years old Meon Single Handle 87830) but it started making squeaking noise and finally the handle broke this morning. Having expected the problem I had bought a Meon Caldwell CA 87888 replacement faucet (dual handle and curved delivery tube), I proceeded to replace it. I had had some difficulty removing the old faucet during the weekend (I wanted to get it replaced before something went wrong) but fortunately I had kept the original box in which the broken faucet came. It had the special tool that allowed me to remove the nut which was practically inaccessible in other ways. This nut held the faucet to the SSteel basin. Once I removed the old faucet, putting a new one took only 20 minutes. I was happy that I could do this without calling a plumber and without flooding the kitchen! Around 1:35 PM I arrived at 1600 Red Barber Plaza and met the pledge coordinator. She was kind enough to show me the script the procedure and the details of being an on-air host. Then I met the Pledge Director and the audio engineer. They explained more details about the 2 hour slot. Today afternoon I debuted my first ever WFSU 88.9 FM (local NPR) Radio Fall pledge drive. My co-host Bonnie Fowler of Armor Realty and I were able to get 21 new or renewing members during our 2 hour slot. Our goal was around 26. This was possible because of supporters from India Association of Tallahassee, Asian Coalition of Tallahassee, Institute of Molecular Biophysics, Dept of Biology, Leon County Public Library East side branch. Bonnie and I are proud to have friends like those who supported our local radio station. Once again I would like to thank all of you for your support of WFSU. Thanks. Today we had to do several errands and so I stayed home. First we took the car for repair and left it in the shop for complete evaluation. Then we went to Lowes and got Fluidmaster tank refill kit and started work on the master bathroom. We also got a Moen kitchen faucet set that I didn’t have time to put it on. Later in the afternoon, we found out the car needs lots of care and so we decided to do one at a time. I worked for the symposium from home. Late in the afternoon the technician from A&E came and evaluated the Kenmore Dryer 80042 and told us fortunately only the belt of the electric dryer is broken and the fix will be around $100 (parts and labor). By then it was too late to pick up the car. So we decided wait till next morning. 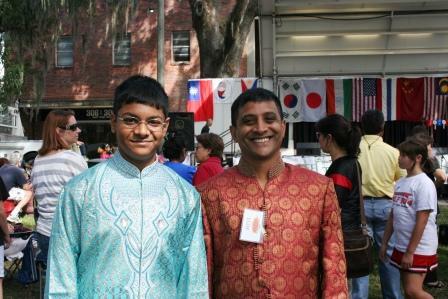 My family participated in the seventh Annual Experience Asia Festival 2011 organized by the Asian Coalition of Tallahassee. I am the Chair-Elect of Asian Coalition, representing India Association. I alone went early in the morning to set up the India Association booth. Then around 10 AM I returned to see the India Association of Tallahassee’s members on the main stage on Lewis Park (the preforming stage). Then Bhanu, VTS, and I distributed information about IATLH and helped kids color pictures of Indian national animal tiger, national flower lotus, national bird peacock, and pictures of elephant and children in traditional Indian attire. We also gave out free of charge bracelet and bhindi for kids. We answered the questions of Girls Scouts of Big Bend about India. Members of EC of IATLH and others helped us out at the booth. The featured performance was by Matsuriza, the Japanese taikko drummers from Orlando, Florida. We had slight shower just before the closing performance by Matsuriza. This morning I came to the Downtown MarketPlace (Downtown Tallahassee’s Ponce de Leon park in part of the Chain of Parks) and spoke to the manager and selected one of the tents that had already been set-up. Two ACTmembers were already there. We all three hung the Asian Coalition of Tallahassee banner and set-up the table and two chairs. We spread the Chinese red table cloth (loaned to us from another member) and started to distribute the flyers. In the afternoon VTS came with me and we stayed for another hour and completed the distribution of post-card sized flyers and closed-down the stall around 1 PM.